Welcome to KCM's media page. We're continuously working to provide helpful resources so that you can walk in the spirit God intends: A spirit of power, love, and sound-mind (II Timothy 1:7). Check-out what we have below, we pray you're blessed as a result! KCM is Honored to Announce Dr. CeCe Rubalcava, Th.D. If we are made new in Christ why do we avoid dealing with certain areas of our life? Why do we tolerate people treating us the way they do? How is it that we keep finding ourselves repeating the same old dysfunctional patterns? We ask these questions because we recognize we're stuck in behaviors that we know are not a part of God's will. Even when we know the answer as to why we do what we do, we often stay stuck. The Conditioned Mind was written to get you out of your rut. To free you from the conditioning factors that keep you stuck so that you can live in the power, love, and soundness of mind The Lord has always intended for you. Have you ever failed in life? The obvious answer is yes. But for some of us, failure has resulted in damaging implications. Some people failed in ways that cost their marriages, their relationships with their children, relationships with family members, friendships—even their careers. Failure can have lasting impacts that lead to guilt, shame, fear, and insecurities—all of which are obstacles to success. The good news is that there is life after failure. We can navigate failure to overcome the hurdles to success. 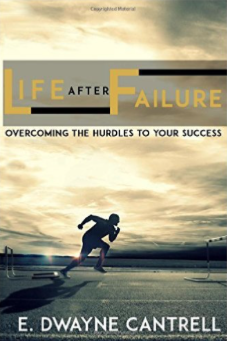 In Life After Failure, Dr. Cantrell gives an in-depth look into his own failures and shares practical steps of how faith, humility, accountability, and hard work can lead anyone to a life of purpose and success. If you have fallen, it is time to get up, get back in the race, and pursue the purpose to which you have been called. Dwayne is Founder and Sr. Pastor of Living Victory Church in Bakersfield, CA., and serves on KCM's Board of Directors as Secretary. Jesus said, that, because of an increase in wickedness in the end of days the love of many will grow cold (Matthew 24:12). Most Christians would agree that we have certainly seen an increase in wickedness over the last decade around the world. This is just one of several signs Jesus exhorts us to watch for (see all of Matthew 24). Yet, our Lord also encourages us, that when we see such troubling accounts taking place we're to look-up because our redemption is drawing near with Christ's triumphant return (Luke 21:28)! So, in the spirit of not allowing our hearts to be troubled (John 14:1-3), we invite you to check out our 2017 Q1 Newsletter, it's packed with positive points and articles on good things we see occurring in the Church today. Click on the image above to view this quarter's newsletter! Want To Subscribe To KCM's Quarterly Newsletter? Enter your email address below, then click the subscribe button. KCM offers a video series featuring our ministers providing brief, but impactful counsel on a variety of subjects. Click and be blessed. This month's featured video is on young adulthood. Need some words of encouragement? Tune-in and listen to KCM's Board Secretary, Dr. Dwayne Cantrell, D.Th., D.Ed. of Living Victory Church! Do you feel led to counsel others through the Word of God? Summit Bible College might have the program for you. Want to help those less fortunate than you? Visit the Mission at Kern County to learn more about how you can be like Christ to those in need! The Bible read fresh every day, listen at Daily Audio Bible.